When I saw this week’s sketch challenge I knew exactly what I wanted to do. I wanted to use the Northern Hearts stamp set to recreate my childhood cuckoo clock. My German grandparents brought the cuckoo clock as a gift for my sister and I. We didn’t get to see my grandparents very often and it is one of the few memories I have of them, as they both died very young. As for the details, there is a lot of sponging going on. Almost all the edges are sponged. The poinsettias come from the Birds & Blooms Die Set. The roof of the bird house is two Modern Label Punch Pieces. The wreath is embossed with clear Embossing Powder on Old Olive. 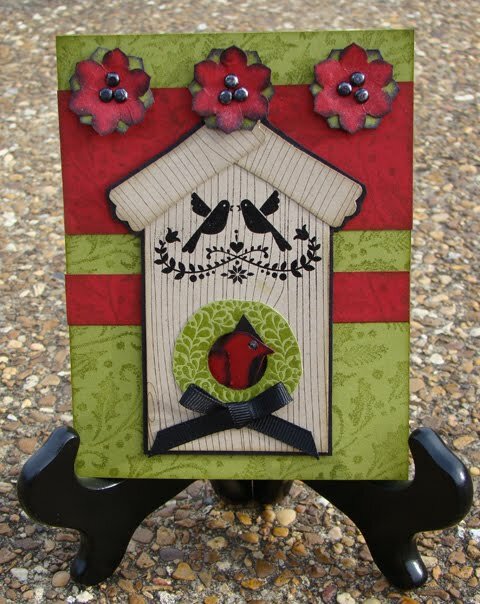 The Kissing Birds piece is embossed with Black Embossing Powder. The little bird also comes from the bird & blooms die set and is actually attached to the inside of the card. He is fastened with a cherry cobbler brad on his tail, so that he can fed back into his house as needed. 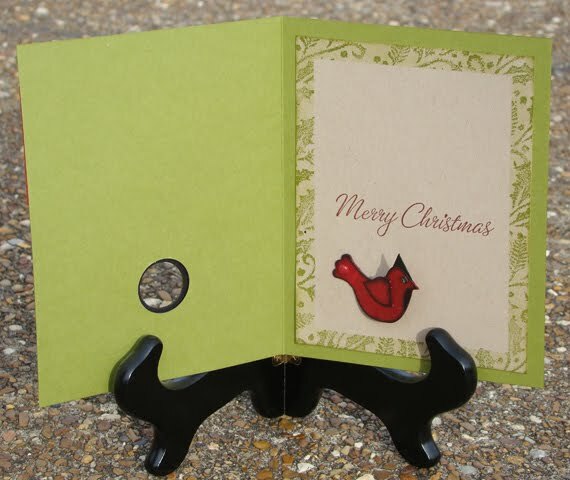 I punched a 3/4″ hole in the wreath and the bird house and made a 1″ hole with the Circle Scissors on the card base because the punch would not reach. I turned the bird into a cardinal by cutting a little triangle piece for the head and sponging his chest heavily with black. 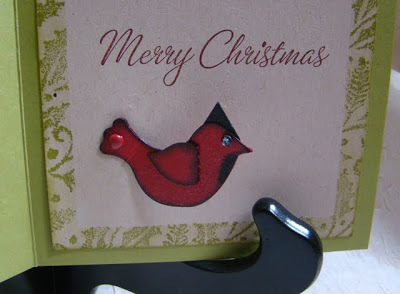 The rest of the cardinal is lightly sponged in black, including the wing. His little eye is a Rhinestone Jewel that has been colored with a black sharpie.